I took this photo in Girona, Spain. The town has a magical feel to it and today I found myself wishing that I was there. I’m not sure what spurred me to wish this, but who cares. It was a great day for us and thinking about it made me smile. This entry was posted in Travel Photos and tagged 50 Year Project, Europe, Girona, Life, Photo, Photography, Spain, Travel Blog, Travel Journal, Travel Photos. Bookmark the permalink. I love seeing places with so much history. They really get my imagination going. I think you would love it Francine. Awesome! 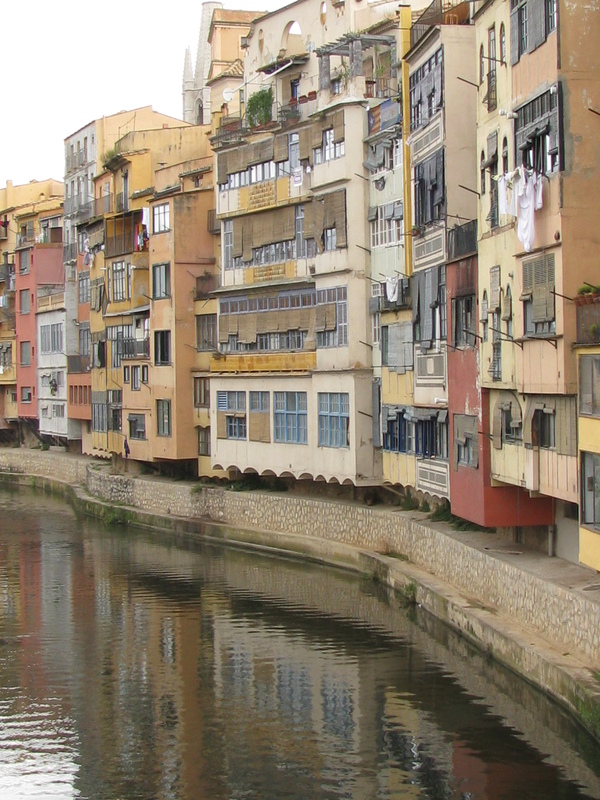 I went to Girona back in 1993 and loved it! I bet it has changed! I wonder how much it has changed. Much of it is so old it’s hard to think that it has changed, but I’m sure it has. I can be ready in a couple of hours. I’ll meet you there :)!! Perfect! And Barcelona isn’t too far away. Very fond memories. I love thinking back on all of the fun we’ve had. It makes the difficult times easier. Ah, life, why can’t it always feel like a vacation. I know it made me smile. I love your description of it! Wow… you don’t want to accidentally drop anything from the window. That’s true. Odds are, you won’t see it again. Great photo and I can see why you fell in love with a day spent here! Loverlly!!! These little cities are so quaint and the people were just lovely. I enjoyed every second it. I can only imagine the view. I would love to see that each day. All I can think about when seeing that photo is, what’ll happen if big flood comes. That would be bad. I don’t know if that’s ever been an issue in the town–I really hope not. That photo made me think of a few places that I’ve visited. The Colours and shape/height of the buildings. Lovely to have a little revisit memory wise. Memories are one of my favorite parts of a trip. We often sit out on our balcony and play the “Do you remember this day?” game. Wow, that’s a great photo of some old(?) architecture! I like it, and the reflection in the water adds a nice touch to the photo. I haven’t been to either yet, but I hope to.